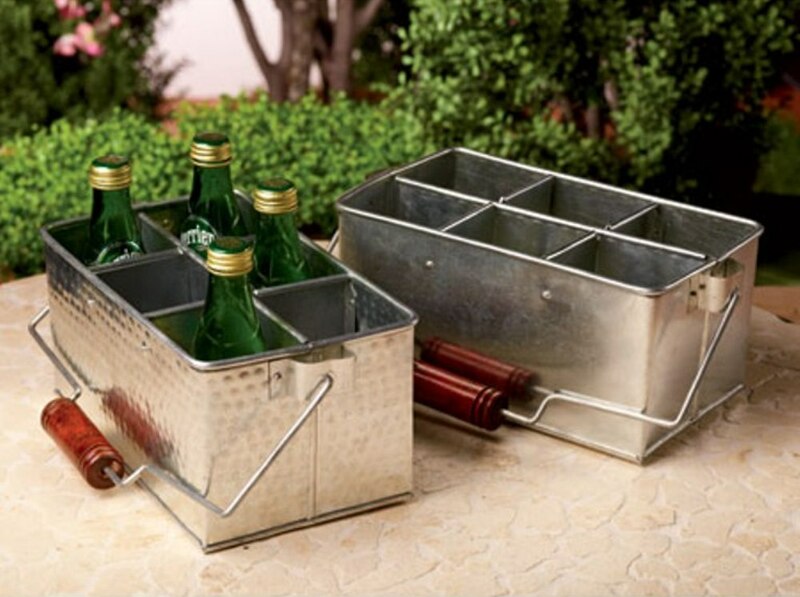 This highly useful galvanized utensil caddy is a perfect way to organize your picnic or dining table. Each caddy has compartments to hold items such as forks, spoons, knives, napkins, salt & pepper grinders and more! The options are endless with this classy, metal hinged accessory. It saves space on your buffet table and is great for Christmas and Thanksgiving buffets, or any celebration. Highly versatile caddy also organizes your desk, vanity items or kitchen counter – perfect for teachers and crafters. Measures 12″ long x 6.5″ wide x 5.5″ high (handle not included in height) 10.5″ high with handle. Bottom of caddy is cushioned at 4 corners to prevent scratching. This Galvanized Flatware Caddy Tin is great as a tailgater organizer or camping silverware caddy. Hammered Caddy comes with 6 compartments and removable center divider to create 3 larger sections. Buffet caddy with removable metal hinged handle is finished in antiqued wood for convenient carrying. Cutlery Caddy measures 12 x 6.5 x 5.5 inches. Bottom of caddy is cushioned to prevent scratching. This versatile decorative organizer tin is perfect for crafting storage or classroom caddy tins.